Search “Red Wine” and you will get millions of hits on it's potential health benefits. This is because it is as popularly associated with health and wellness as dark chocolate and coffee, regardless of the facts. In spite of the potential health benefits, frequent consumption is still not advised. Red wine has in fact shown to benefit heart health but only in moderation. Red wine has also been a hot topic in possibly decreasing risk for cancer, minimizing neurological degeneration, and promoting the good bacteria growth in your gut, "in moderation". So what exactly equates moderate red wine consumption? A serving size of wine is 4 ounces. Health benefits, such as promoting heart health, have been observed at 1 serving per day for women and 1 to 2 servings per day for men (1). Elevated levels of LDL (the "bad" cholesterol) and low HDL (the "good" cholesterol) are associated with cardiovascular disease risk. The blood thinning effects of alcohol, such as red wine, have been shown to increase HDL and lower LDL (2, 3). Whether or not you reap more benefits for your heart by choosing red wine over other alcohol options such as hard liquors or beer remains somewhat controversial. The idea that red wine is superior derives from the high content of antioxidants such as resveratrol and polyphenols found in red wine (4, 5). While the antioxidants in wine may provide your heart with more of a benefit than other alcoholic beverages, it may serve your health in other ways. Red wine may decrease an individual’s risk for cancer and reduce the growth of tumorous cells (1). The polyphenols and resveratrol present in wine are believed to suppress the factors in our body that are responsible for cancer growth and survival (6-8). 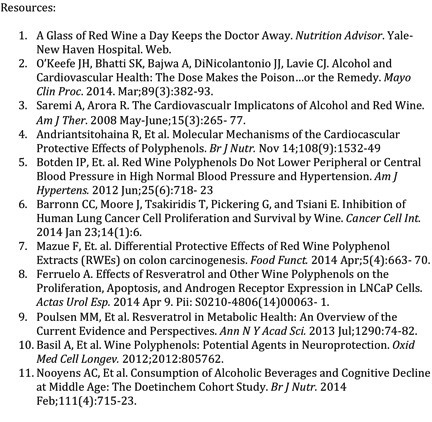 While the potential to prevent and stop cancer growth by drinking wine is exciting, it is also unrealistic. Not only is the research relatively new, but also no "easy fix" can replace a well-rounded approach to health care. Over-the-counter resveratrol supplementation is another growing market, however it is important to know that the medicinal justification has not yet been well established (9). Red wine has also been seen to decrease your risk for developing neurological disorders such as Alzheimer’s and Parkinson’s disease. The antioxidant compounds that are present in wine, especially dry red wines, may help to suppress free radicals that could otherwise promote early breakdown of cells in the neurological system. Moderate red wine consumption appears to have neuroprotective properties but more clinical trials must be conducted in the future in order to validate this claim (10, 11). Remember, heavy drinking is neither a great idea nor a good habit and can have some serious consequences on your health. Some concerns with excessive alcohol consumption include increased risk for cardiovascular disease, liver disease, cancer, and premature death (2, 3). Despite the health benefits of moderate alcohol consumption, clinicians do not promote its’ use because the risk of alcohol abuse is far too high and not worth the ramifications. At The Sage, we believe in enjoying life to the fullest. Sometimes, this includes enjoying alcoholic beverages (in moderation, of course) - if this results in health benefits, even better!